On the road with President Putin Jump to media player President Putin says Ukraine will have to pay for its imports of Russian gas in advance. Daniel Sandford travels alongside the president, and watches as he holds a meeting. How Russia is reporting on Ukraine Jump to media player Russia's neighbours have been complaining that it is broadcasting "propaganda" on its television channels. Daniel Sandford has a snapshot of Russian television news. Ukraine 'will protect itself from Russia' Jump to media player Ukraine deputy foreign minister Danylo Lubkivsky says that many of the pro-Russia demonstrators that seized government buildings on Monday were "Russia's own citizens". Russia urged to 'step back' Jump to media player Nato Secretary-General Anders Fogh Rasmussen has urged Russia to "step back" in order to stop the crisis in Ukraine from escalating further. Ukraine: Inside Donetsk 'republic' Jump to media player The Ukraine authorities say they have seized back control of the regional administration building in the eastern city of Kharkiv from pro-Russia separatists. Violent brawl at Ukraine parliament Jump to media player Tempers flared and punches were thrown in Ukraine's parliament on Tuesday as opposing nationalist and separatist factions traded blows. President Putin has said Ukraine will have to pay for its imports of Russian gas in advance. The Russian president said his state-owned supplier, Gazprom, had the right to invoke a clause in its contract and demand pre-payment if Ukraine did not clear its arrears. 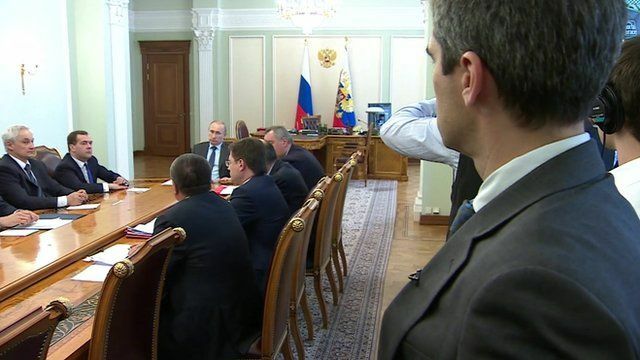 Daniel Sandford watched as President Putin met with top officials.